This is a unique yet luscious blend of freshly ground pumpkin, blended into a warm, rich, milk chocolate base...sprinkled with sweet warm spice. This is a perfect fall treatment! This wonderful treatment starts by soaking into a basin of warm pumpkin cocoa scented silk soak. Followed by our warming, chocolate pumpkin sweet sugar scrub. Our scrub is a thick, creamy blended of skin softening shea butter, pure cane sugar, pumpkin pulp, pumpkin flakes of dried pumpkin and cocoa absolute for an added exfoliation. 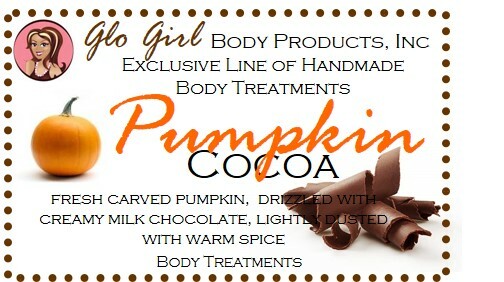 Your treatment ends by massaging with our pumpkin cocoa whipped body soufflé.